No one could blame you if you’re feeling a bit Peter Pan-ed out. What with all the movies, TV specials, Broadway musicals, books, and touring stage productions, The Boy Who Wouldn’t Grow Up has spawned The Industry That Won’t Give Up. Yet it turns out there’s a cure for Pan fatigue, and it involves a return to first principles. (Take note, custodians of those interminable superhero movie franchises.) Embedded within J.M. Barrie’s original tale is the idea of the individual imagination as an unlimited force, or as — to borrow an image — an open window through which we can fly on the way to richer lives. That still-nourishing notion is central to “Peter and the Starcatcher,’’ written by Rick Elice and based on a novel by Ridley Pearson and the legendary newspaper humorist Dave Barry. In the high-spirited, low-tech, altogether hard-to-resist production of “Peter and the Starcatcher’’ at Lyric Stage Company, inventively directed by Spiro Veloudos, there are no special effects on display, unless you consider charm and whimsy to be special effects. Some family-friendly shows are cloying or dumbed-down, but not this one. Indeed, the story line is on the convoluted side. 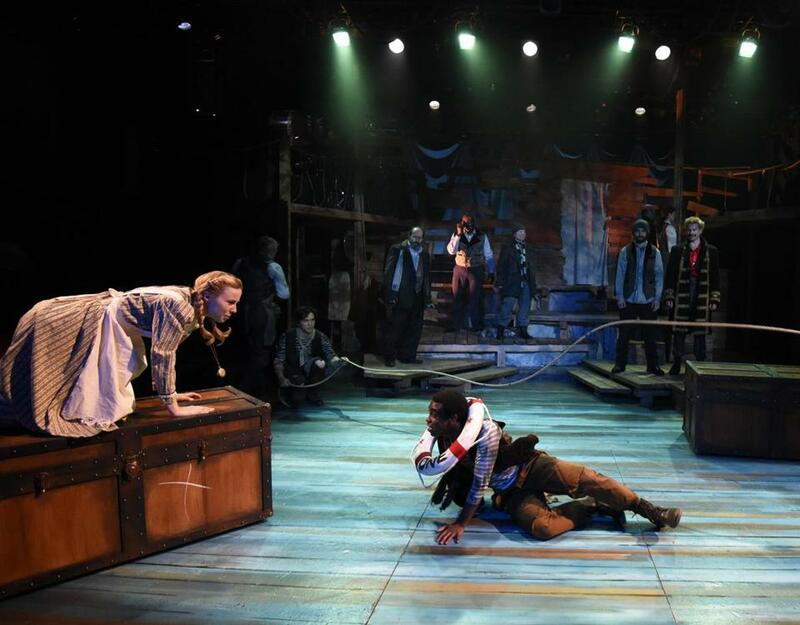 But if you want to show your kids what theater can do — and, for that matter, what their own imaginations can do — “Peter and the Starcatcher’’ is not a bad place to start. In the tradition of story theater, “Starcatcher’’ features double-casting (Veloudos’s ensemble adeptly shifts from one role to another), musical interludes (composed by Wayne Barker), and a deliberately makeshift set (by Janie E. Howland). A treehouse-like structure of planks serves as ship and island alike. The effect of churning waves is conjured by a simple length of rope. When the script calls for a flying cat, a stuffed animal is carried about on a pole. When a bird materializes, it is in the form of a yellow glove waggled on an actor’s fingers. Among the treats offered by “Starcatcher’’ is the return of the gifted Erica Spyres, appearing on a Boston stage for the first time in almost two years, having been pursuing other endeavors that included a role in the national tour of “Once.’’ Hearing Spyres do a Norwegian accent in one scene is almost worth the price of admission to “Starcatcher’’ all by itself. She plays Molly, the precocious and strong-minded daughter of Lord Aster (Damon Singletary, excellent), appointed by Queen Victoria on a secret mission to transport a trunk of precious “starstuff,’’ a powerful substance that descended from the sky. Molly encounters an orphan known only as Boy (Marc Pierre), later named Peter. Their mission: to keep the starstuff from falling into the hands of the dastardly pirate Black Stache. Ed Hoopman is consistently funny as Black Stache, a would-be swashbuckler whose menace is undercut by his propensity for malapropisms, and who is destined to become Captain Hook after a certain calamity befalls him. The black greasepaint mustache Hoopman wears amounts to an inside joke for those who recall the one he wore five years ago as Groucho Marx in Lyric Stage’s production of “Animal Crackers.’’ Among the other cast members who contribute flavorful performances are Will McGarrahan, Margaret Ann Brady, Alejandro Simoes, Robert Saoud, and Margarita Damaris Martinez. Choreographer Ilyse Robbins channels the spirit of Busby Berkeley in an uproarious vaudeville routine that showcases a squadron of mermaids in riotously colorful costumes designed by Elisabetta Polito. The production abounds in amusingly groan-worthy puns, along with, less felicitously, references to things like the Michael Jackson moonwalk video. Inevitably, Donald Trump’s name comes up. Straining for quasi-contemporary resonance was also a characteristic of the best-known theater prequel of our times, “Wicked.’’ What “Wicked’ did for “The Wizard of Oz’’ — supply an intriguing backstory to a beloved children’s tale — “Peter and the Starcatcher’’ does for the tale of Peter Pan. Although the resemblance between the two prequels pretty much ends there, you may find that “Starcatcher,’’ like “Wicked,’’ has a way of insinuating itself into your perceptions of the original.